Lately I’ve been toying around with simple colorful designs, and just practicing my line work. I had also recently purchased the colorful, Summer-y polishes at CVS and really wanted to use all three colors together. 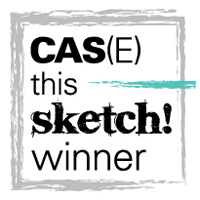 This is another design based on doodling. I used the nail art pen to draw a few lines and patterns on each nail, and then used the individual brushes in each polish, or a dotting tool, to fill in the negative space. Once it was all dry, I used a few dabs of top coat to affix some nail art studs, then painted over everything with some more top coat. Well, I had apparently maxed out on my media storage space and had to upgrade with wordpress, so I missed some posts. All’s well now, for at least a little while longer! 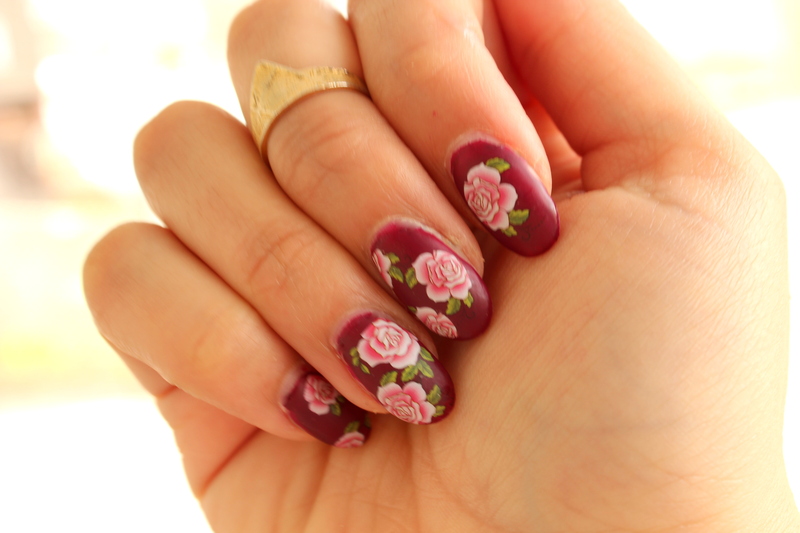 I had ordered some flower water decals from Born Pretty Store, and at first sight, I wasn’t crazy about them. They’re basically stickers for your nails, that you dunk in water and place on. 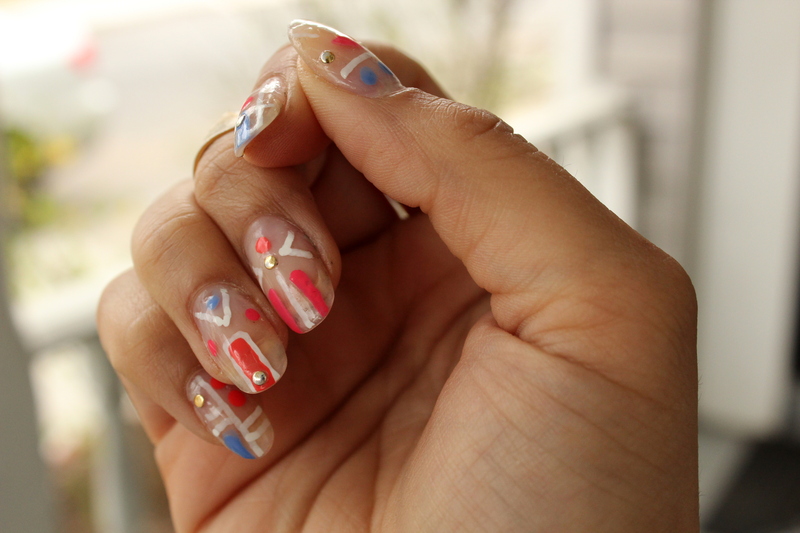 Ain’t nothing wrong with that, I just thought they might look too much like shiny little stickers on my nails. To my surprise, they didn’t! Once you remove the backing, they just blend in and look like they belong. I even had some people asking if I hand painted the flowers (maybe some day I’ll be that good). I actually loved the way they came out. I think what made me love the look even more was that I topped everything with a matte top coat – I love me some matte nails. After two coats of Ruby Do, I waited for my nails to dry and then placed the decals. 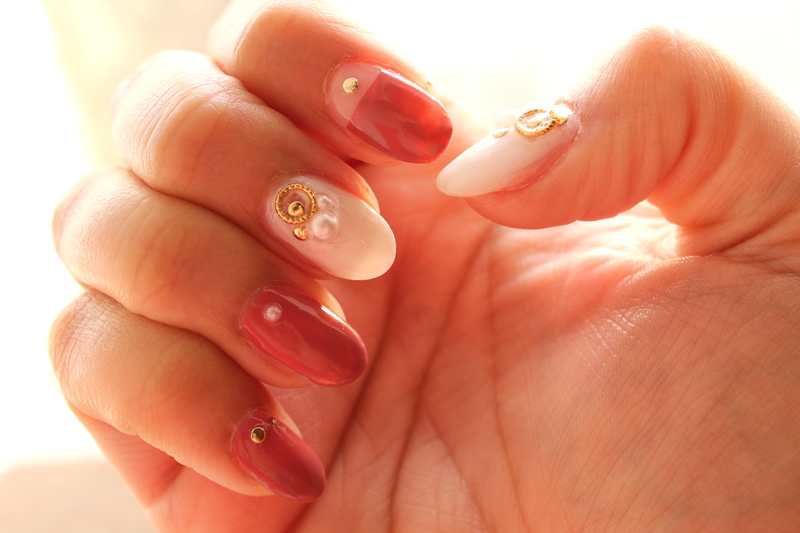 I used two on just about every nail, varying each nail slightly. Once finished I added two coats of the big matte top coat and was finished. 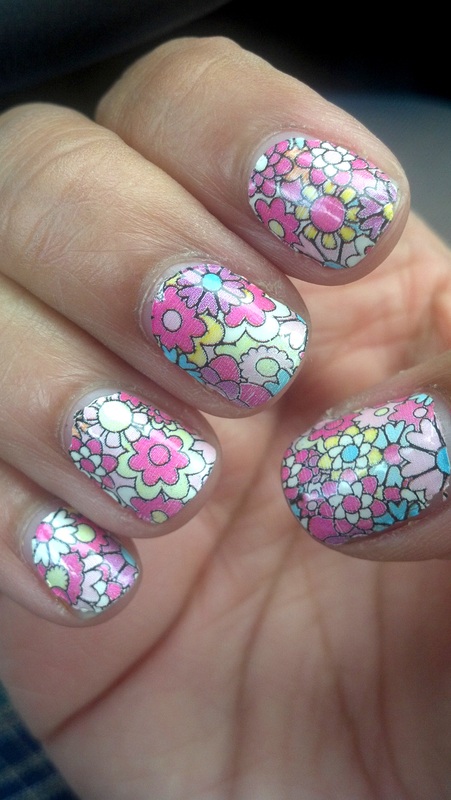 I see more water decals in my future! 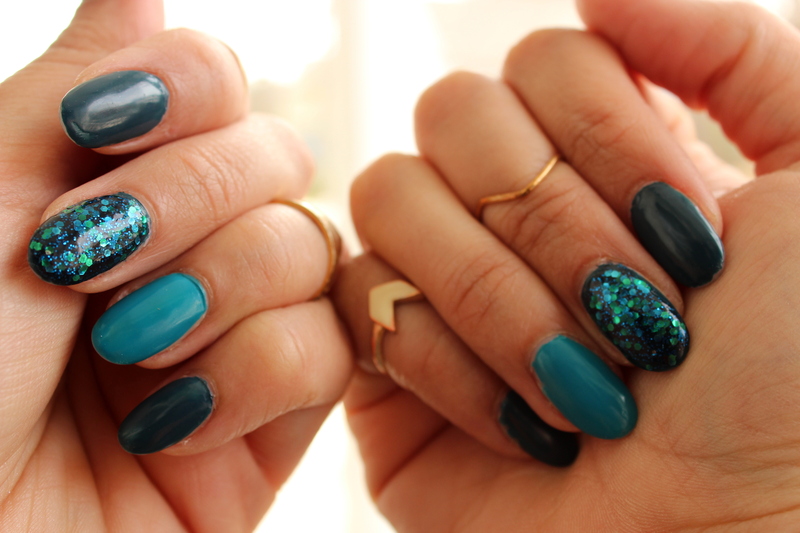 They truly are a quick and easy way to jazz up your nails with minimal effort. Blue nails! Very unlike me. 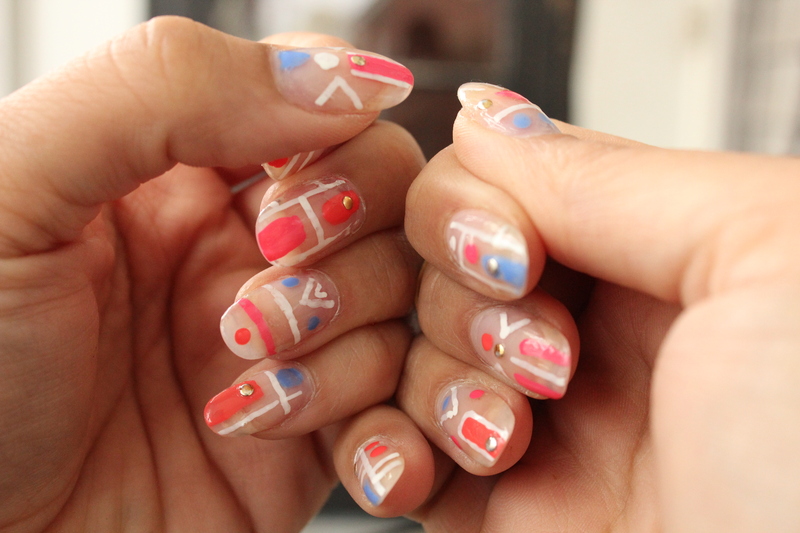 This easy ombre mani was inspired by @ninanailedit‘s instagram page. I just love her nail designs. I saw this one on her feed and had to recreate it. 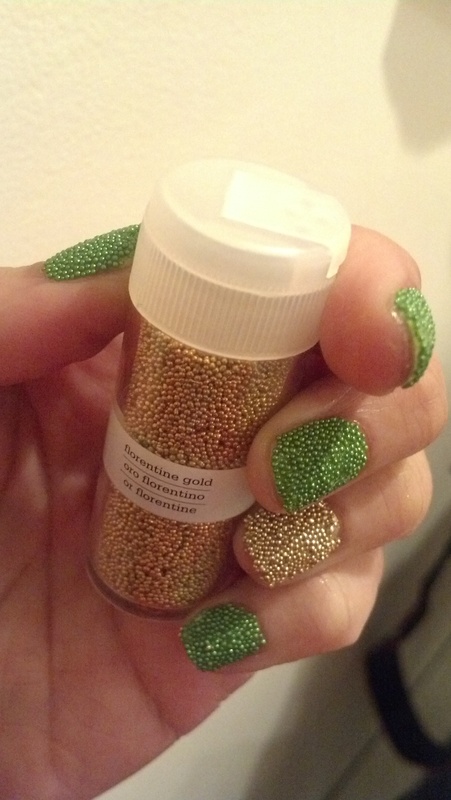 When painting the glittery Mermaid’s Tale color on my middle finger on each hand, I attempted some glitter placement – that is, using a toothpick or dotting tool to place glitter pieces one at a time – but I just didn’t have the patience for it. Despite my lack of patience, I do love the blue-green sparkle of that polish and am happy with how it came out! You know, for St. Patty’s day! 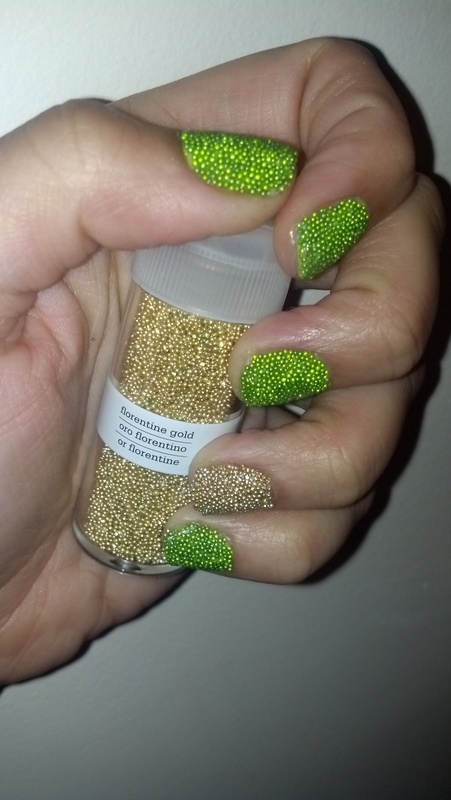 I wanted to do something quick and easy but a little different, so I decided on a caviar manicure (check out my first caviar mani post here). After a base coat on all nails, I painted on two coats of the green on every finger except for my ring finger on each hand. On each ring finger, I painted on two coats of Luxe. Then, I painted on a pretty heavy coat of the Seche Vite and immediately poured the microbeads onto the nail. Once you’ve got your nail covered with microbeads, press them down gently onto the nail to sort of smoosh (technical word) them into the topcoat so that they adhere and stay. 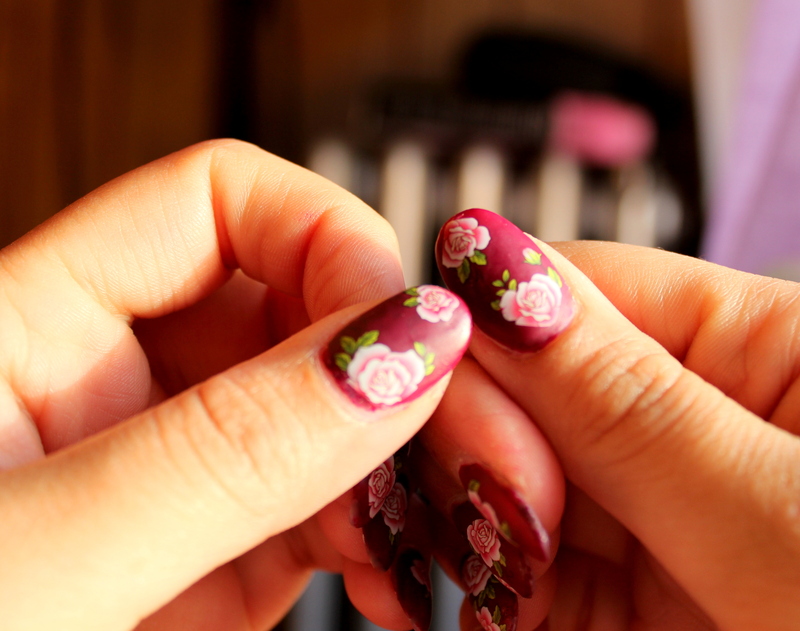 Do one nail at a time and repeat the process as you go. I took a few photos with the flash to show the sparkly-ness. I don’t think D and I will be doing anything too special to celebrate the day, although we might have some corned beef and cabbage… YUM! Are you doing anything to celebrate St. Patrick’s day? Perhaps some fancy nail polish? I’d love to hear your plans! This week I tried out some Sally Hansen Salon Effects nail laquer strips. I found them at my local drugstore. It took me a long time to decide what pattern/print/color I wanted since there are SO many to choose from, but I finally decided on this cute flowery pattern, called Girl Flower. Full disclosure: I don’t love the nail strips. While they are definitely quick and easy to apply, and come in all colors and patterns, they didn’t last very long and left a sort of lip at the base of the nail which would snag in my hair sometimes. So weird. They are also a pain-in-the-you-know-what to get off and I’m not sure they were worth the price for me, since they didn’t stay on nearly as long as I thought they would. Ok, I’ve hated on the nail strips for long enough. They really are pretty effortless and quick, and you might have a completely different experience from me, so if you want something quick, fun and easy, try these!